This post contains affiliate links, which means that if you click them and make a purchase, I can earn a small commission. Trying to mentally prepare myself for fall is never an easy task. Don’t get me wrong. I’m all about everything pumpkin spice, plaid shirts, and being able to dig my beloved boots out of hiding. But the change of seasons is always bittersweet. Winters here in New England are brutal, and fall sometimes feels like a pretty little distraction from the impending dark and cold. But, before I get myself too depressed thinking about Connecticut mid-February, let’s put the focus back on what we’ve got to look forward to in the coming weeks. Fall makeup might just be my all-time favorite of the entire year. Vampy reds, lush berries, rich chocolate tones…it’s basically the season for extra sultry glam. While blindingly bright highlighters were all the rage this summer, the sparkle factor appears to have transferred to the eyes for fall. Whether you’re just adding a bit of shimmer to the lid, or incorporating serious metallic shine into a full-on smokey eye, there are tons of options popping up at every price point to unleash your inner MUA. 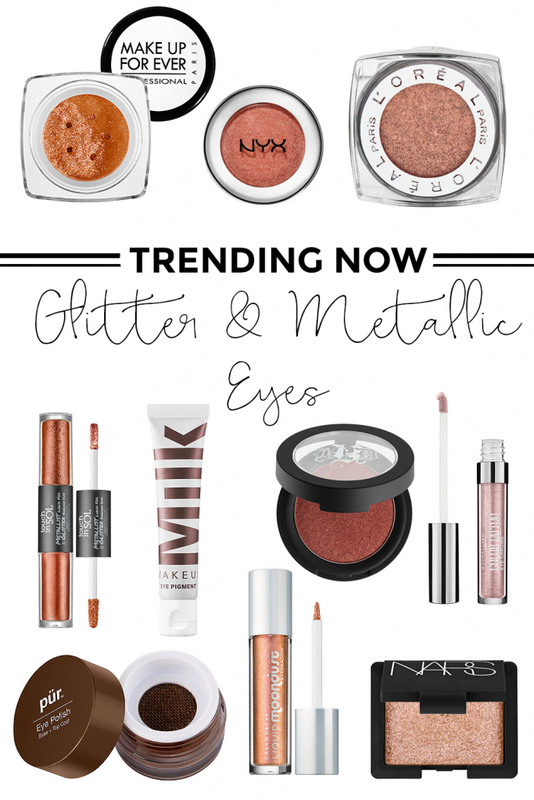 As someone who’s always had a soft spot for glitter, I’m welcoming this trend with open arms. 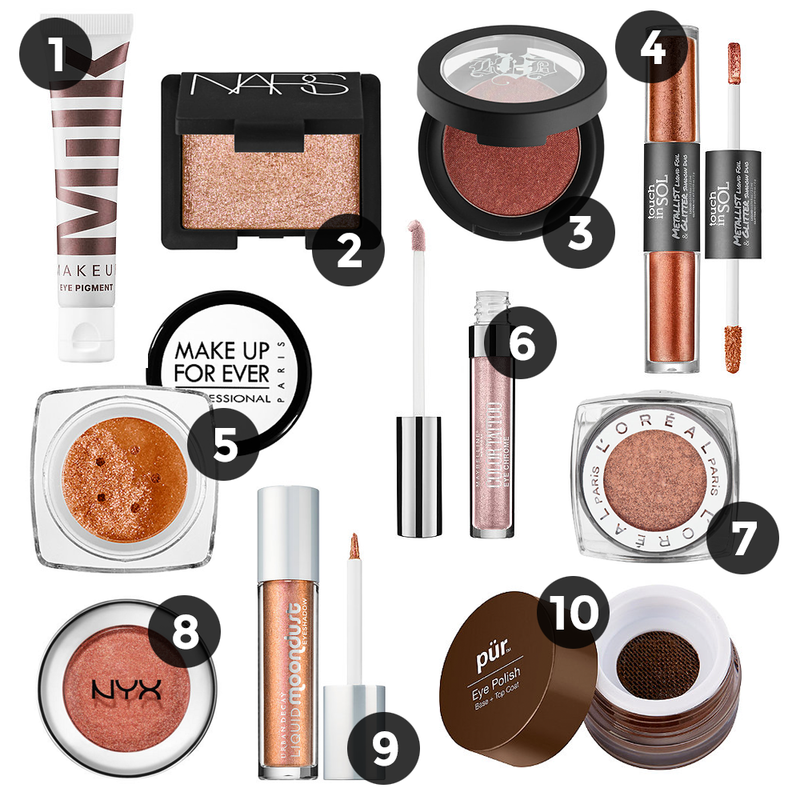 The combination of a warm, inviting fall color palette with intense sparkling shine is especially gorgeous, and has me totally inspired to create some killer eye looks. 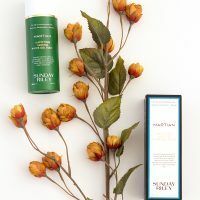 If you’re as into this trend as I am, here are some product recommendations to get you started! Milk is all about high-impact makeup with low fuss, and this cream shadow is no exception. Crease-free, blendable, and budge proof, you can easily swipe this product on with your fingers for a simple look on-the-go. I’m currently lusting after the shade Silent Disco, a deep chocolate brown that’s perfect for a imperfectly perfect smokey eye. These ultra-glittery metallic NARS shadows are so gorgeous, you’ll want to own them all. But if I had to pick one, Outer Limits (an iridescent rose gold) currently has my heart. Apply dry for a sheer wash of color, or wet to intensify the shine. I remember the day I first swatched these eyeshadows in Sephora, and how blown away I was by the pigmentation. 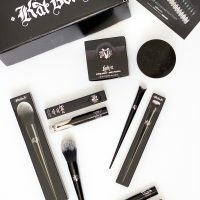 As a Tattoo Artist, it’s no surprise that Kat Von D makes products with an impact. If bold, metallic color is what you’re after, look no further than the Metal Crush Eyeshadows. There’s a whole rainbow of shades to choose from, but I think Doce (copper) and Raw Power (mahogany) are going to be especially beautiful for the fall. Whenever Tati Westbrook puts her stamp of approval on a product, it’s bound to sell out for months. Such is the case with these beautiful Touch in Sol Eyeshadow Duos. One side contains a creamy metallic shadow, and the other an intense foil pigment for creating some serious statement eye looks. If you’re looking for a slightly less pricey version, the Revlon PhotoReady Eye Art Duos are very similar! Whether you use these as an eyeshadow base, a topper, or all on their own, these new metallic cream eyeshadows from Maybelline are an awesome (and affordable) way to get your shine on. The shade Gilded Rose is calling to me as a beautiful inner corner/lid highlight. These eyeshadows have been cult-favorites from the drugstore forever, and for good reason. With intense, long-wearing pigmentation and a range of gorgeous colors to choose from, they’re some of the best budget-friendly metallic shadows on the market. The shade Amber Rush is perhaps one of the best known of all, and is the perfect copper hue to kick off fall. If you’ve been around these parts for a while, you’ll know that I’m a huge fan of these shadows. Buttery soft and beautifully pigmented, they’re SO GOOD for the price. You can check out my full review here if you’d like to see the swatches for yourself! This exciting new launch from Urban Decay takes their original Moondust Shadow formula and transforms it into a liquid-cream. The brush-tipped applicator is perfect for precise application, and you could easily wear these as liners or all-over-the-lid colors. If powder shadows are more your speed, never fear. They’ve also released the new Moondust Palette, with 8 new crave-worthy shades. Words cannot express how beautiful these eye polishes are in person. They have a strange liquid-gel texture when wet, but dry down to an ultra-shimmery, powder-like finish. The whole range of shades is perfectly fall appropriate, making it hard to pick just one! Are you loving this trend? Which product are you currently coveting?